Federico Garcia Lorca (1898-1936) was the jewel of the Generation of ’27; a group of poets and other artists that included – in its broadest sense – Luis Buñuel, Salvador Dali, and the torero Ignacio Sánchez Mejías. It was the death of this literary bull fighter that inspired Garcia Lorca to write one of the greatest poems in the Spanish language. Garcia Lorca was born a few miles outside of Granada. He was devoted to the spirit and feel of his native region – Andalucia – which is particularly apparent in his poem, the subject of this article. He also had a deep affinity for both music and literature. He was very close to Manuel de Falla. He spent a year in the US, mostly in New York, He also visited Vermont and Cuba. He was an on site observer during the stock market crash of 1929. This event helped solidify his socialist convictions. On his return to Spain he achieved fame, which endures to this day, as a playwright. His political views and his homosexuality made him a target during the early days of the Spanish Civil War. He was arrested on August 19, 1938 by a Nationalist militia and likely executed the following day. His body was never found and the details of his fate remain uncertain to this day. His premature death is an incalculable loss to literature. Ignacio Sánchez Mejías (1891-1934), the subject of Garcia Lorca’s great poem, had a career unlike any other matador. The son of a doctor who wanted him to pursue medicine, Sánchez drifted into bullfighting. His childhood friend was José Gómez, later famous as Joselito. He and Juan Belmonte were the two greatest toreros of the first part of the 20th century. Sánchez worked as a banderillero for both of them. In 1915 he married Joselito’s sister. In 1919 to took his alternativa (the ceremony whereby a novillero becomes a full fledged matador) at the hands of Joselito with Belmonte as witness. He became very famous and performed very often. His was handsome and very brave, though he lacked the technical skill of either Joselito or Belmonte. He was on the cartel the day (May 16, 1920) that Joselito was killed by the bull Bailaor; he had to kill the bull that had killed his brother-in-law who was more like a brother to him. He was distraught over the death of his friend. He watched in tears over the corpse through the night. He was seriously injured many times. Like so many other bullfighters he retired only to return to the plaza. He also was a writer, critic, playwright, novelist, polo player, and auto racer. His love affairs were titanic. He became intertwined with the Generation of ’27 and became friends with Garcia Lorca. In 1934 he had returned to the bulls. In August of that year he was asked to be a last minute substitute for Domingo Ortega who had been injured in an auto accident. At that time he had no cuadrilla. He didn’t even have a car or a hotel room. He had to go himself to the drawing that assigns the bulls to each matador on the card. This is a task always performed by an underling. The corrida was held on August 11 in Manzanares. His first bull was a poor specimen, Granadino, who nevertheless gored him in the thigh. Sánchez Mejías did not trust the poor medical care in Manzanares and asked to be transported to Madrid. The ambulance transporting got lost and it took hours longer than needed to get him there. He soon developed gangrene and died on August 13. At the time it was infection and blood loss that were responsible for most deaths from the horns of the bulls. This first cause is the reason there is a brick in the courtyard of Madrid’s main bullring, Las Ventas inscribed To Alexander Fleming with gratitude. 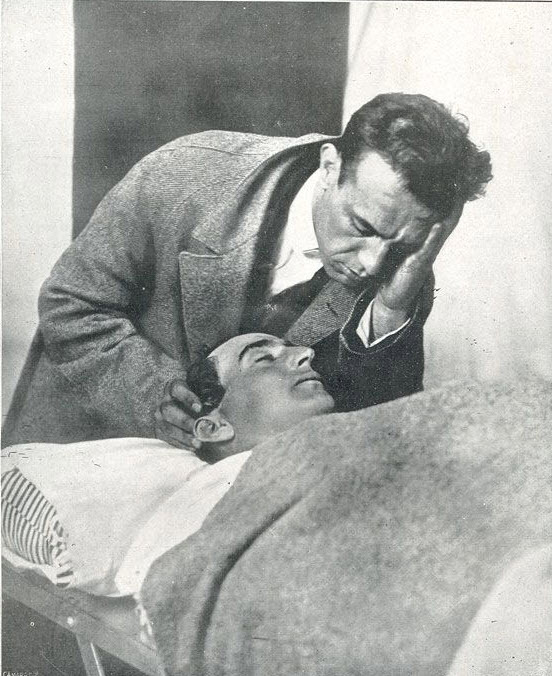 Garcia Lorca’s elegy to his friend was published the year after his death. It is usually translated as ‘Lament for the Death of Ignacio Sánchez Mejías’ though llanto means crying or weeping. The poem is in four parts, each with a different meter and style. It is immediately below. Following the poem is an English translation by me. I have made no attempt to reproduce the poem’s rhythm. Neither have I made a word for word translation, rather I have attempted, however imperfectly, to capture the feel of the poem. The reader must remember that poetry is what is lost in translation and that Garcia Lorca was far better at Spanish than I am at English. Readers fluent in both Spanish and English are welcome to submit suggestions that might improve the translation, though it can never be more than a dull shadow of the original. Following the poem and its translation is video of the great Argentine actor Alfredo Alcón (1930-2014) reciting the poem. A second video is a flamenco ballet based on the poem. It’s by the Ballet Flamenco de Andalucía. The reader and viewer must know that the moves of both flamenco and the corrida de toros are almost identical. Of course, the former risks only the wrath of an audience. As for the latter, Blasco Ibáñez wrote in his anti-bullfighting novel Sangre y Arena (Blood and Sand) that the only beast in the plaza de toros is the crowd. The photo above the title shows Sánchez sitting on the estribo about to pass the bull. He was famous for this maneuver and it was in this posture that he received his fatal wound. And the bull alone with heart high! At five o’clock in the afternoon. Ah, that terrible five in the afternoon! It was five in the shadow of the afternoon! tired of treading the earth. with all his death on his back. but the dawn had gone. He was made of moderation. What a great figure in the heights! How gentle with the harvest! How stunning at the fiesta! But now he sleeps forever. Enters the center of his skull. Oh, black bull of shame! Oh, harsh blood of Ignacio! no silver glass can cover it . without smooth waters and icy cypresses. with trees formed of tears and ribbons and spheres. loosening its limbs without the loss of blood. only plazas and plazas and more plazas without end. and has dressed him the head of the dark Minotaur. It is over. The rain pierces his mouth. Is warmed at the summit of the herds. What do they say? A malodorous silence descends. now pitted with bottomless holes. Who gathers the shroud? What they say is not true! The spurs do not sting, they do not terrify the serpent. to see his body without repose. I want the tough talking men here. with a voice full of sun and flint. I want to see them here. In front of the stone. In front of this this body with broken reins. for this captain bound by death. The fervid breathing of the bulls. and lost in the white brush of frozen smoke. that he may feel the death he carries. Flee, Ignacio, do not feel the hot bellowing. Sleep, fly, rest, even the sea dies! or the horses, or the ants in your own house. nor the black silk, where you were torn apart. like a heap of lifeless dogs. Forever I sing of your style and grace. Of the great maturity of your understanding. Of your appetite for death with its taste in your mouth. The sadness of your brave gaiety. an Andalusian so bright, so rich in adventure. and I remember a sad breeze over the olive trees.